There is something inherently enjoyable watching the cast of Boris 2 in the fish-out-of-water opening to the show. Boris the fish also seems to find the floating and singing an amusing affair even with the big splash finale. Boris was a very popular TV series in Italy after its first season. 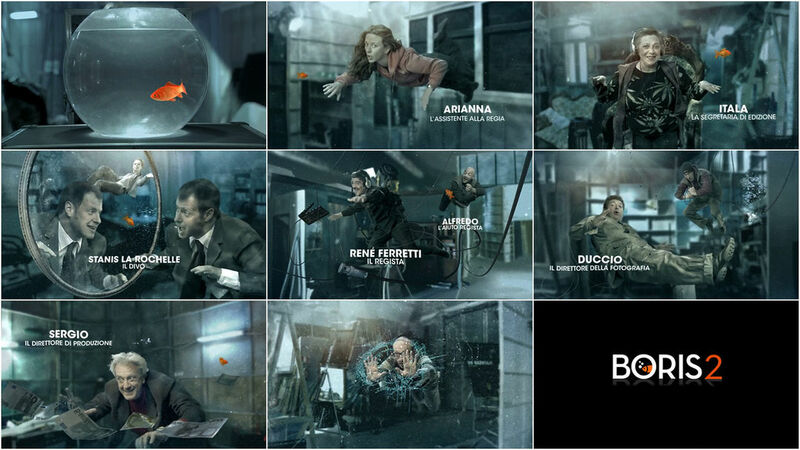 When the producers decided to make a second season, Piero, a project manager from Fox Channels Italy and Juan Pablo, the art director, invited CREATOR to test how we would imagine the actors underwater. The series takes place in a film studio, and the director always asks for advice from his best friend BORIS the fish. Fox liked what they saw and we got the job. It was impossible to schedule a shoot with all the actors together so they were shot against green screen. Keying the actors took some time. After we got the footage it took about 6 weeks to reach the final result. We just won the silver at Promax|BDA in New York.